I pre-ordered my new travelmate, my 5D Mk II, in early October and on the 23rd of December Photografica called me; my copy was now in store! I just had time to pick it up before flying to see family for Xmas. I had very few opportunities to go out and shoot with my new tool due to Xmas celebrations and a never ending supply of boring grey overcast days. Fortunately one afternoon offered some great surreal light! These are single image shots at iso100; and apart from the 14-bit 21 mega pixel raw files the 5D Mk I would have produced similar results I reckon. This is not a review; nor a test of noise or black spots etc. It is simply my first impressions as a photographer (not a gear head / pixel peeper) using the 5D Mk II. Cameras don’t take pictures, photographers do. It is a strange feeling to use a brand new camera! My old 5D is battle worn with scratches and dust; the Mk II is impeccable (for now; hehe). As a 5D Mk I user, the Mk II is super easy to get going and use. It’s an upgrade; not a new camera; so it’s still my good old mate the 5D ! The 14-bit 21 mega pixel RAW files are about 25-26 MB in size and a whopping 5616 x 3744 of drop dead gorgeous pixels! I sell most of my prints at sizes from 70cm wide up to 2 meters (8 meters being the current record) so I need all the pixels I can get! Yes, stitching is amazing but not always possible, and the 21 megapixels is going to make a huge difference for my work. ISO display in the viewfinder! Finally. Might prevent me from shooting those sunrises at iso 800 having used iso 800 the previous night and forgetting to reset. My head is in the clouds and my feet aren’t touching the ground much either when I shoot so I need all the help I can get! Brilliant 3” lcd screen is a huge upgrade from the old 5D Mk I and is beautiful to behold. Not really anything to do with the 5D Mk II but bloody f#”£€#&!!! Image Stabilizer on the 24-105mm lens. I forgot to turn it off and when shooting from a tripod the IS ruins half the shots. Only remembered to turn it off half way through the shoot (my brain was frozen). Menu is a lot easier to navigate and the customizable My Menu is a neat idea. Makes it easier to access options like Mirror Lock Up especially as we still do not have a dedicated Mirror Lock Up button. I still miss having a histogram display mode with just a huge RGB histogram on the 3” lcd screen. In strong outback sunlight it’s next to impossible to see the small RGB histogram although I suspect the brilliant 3” lcd screen on the 5D Mk II will help slightly. Still; can I please have a histogram mode with an RGB histogram and nothing else. Live view mode is surprisingly good and useful! HD Video is looking very nice indeed (although I am useless at shooting and editing video)! Automatic sensor dust cleaning is a brilliant feature – if it works. Time will tell. The old 5D sensor was a dust magnet so it couldn’t get any worse! As I get a lot more exposures with my new mate I will post much more in depth experiences here. Especially Live view and Video are totally new to me. For now; these are just my very first impressions. Can’t wait to bring the 5D Mk II to Africa and Australia and really road test it! – and happy new year everyone! Merry Xmas – God Jul! I would like to wish all of you a merry xmas –hanukkah – etc – however you celebrate this holiday I hope you and your loved ones have a great time! A special season greetings to my customers, it has been a pleasure selling photos to you! Incidentally, “God Jul” is of course Danish for Merry Xmas, bit of language schooling for my dear readers today! Photografica called a few hours ago and I just picked up my early Xmas “present” – Canon 5D Mk II! Expect a couple of reports from me in a few weeks, if we ever get some sun in this dark bleak place! Purnululu National Park in The Kimberley in Western Australia is a World Heritage site, home to spectacular 500 meter tall orange sandstone domes of the Bungle Bungle Ranges. Aboriginal people have been living here for tens of thousands of years of course but amazingly Purnululu was not really known until the 1980s when a TV-crew flew over and filmed this huge magnificent area. It is a very significant site to the traditional owners and it’s easy to see and feel why when you visit this mysterious and magical semi-desert landscape of caves, gorges, chasms, creeks and last but not least – the mighty beehive shaped domes! When I spend time in the great outback of Australia I always wonder what it would be like to live here thousands of years ago in the traditional aboriginal way. In tropical Kakadu National Park with years of training and some help I reckon I could survive as a white aboriginal wannabe. There are rivers, plenty of water, wildlife, food and plants and great rock shelters to live in. In The Kimberley I would be in serious trouble but there are still shelters, gorges and water if you know where to find it; even if the climate is seriously hostile. In the desert I would simply die. I would die very happy but I would definitely die. How the desert people survived for thousands of years, finding food and water and surviving the heat in places like this is an incredible feat! In September I visited Purnululu National Park twice – and survived! We cheated though; as we brought food and water with us so not exactly living off the land in traditional way! Phenomenal Purnululu has quickly become one of my favourite places in Australia; it’s unlike anything else and a must-experience. Purnululu is accessed via a 54km 4WD only dirt road that is only open in the dry season. You need to bump along this bumpy road for a few hours and bring all essentials as there’s no food or drinking water available in here. You can get chopper lifted in from Kununurra and stay in the fancy permanent upmarket APT permanent tent camp but where’s the fun in that. No you bring your swag and stay at one of the two very basic bush camp sites and experience the outback the only proper way and prepare to be amazed! Be amazed by the outback experience, the towering 500 meter tall beehive shaped domes, the wondrous chasm, gorges and plains. Check your swag before sleeping though, there are some nasty foot long centipedes around and this being Australia they are of course venomous and they bite! But I can’t wait to return and take on the domes again as I feel I didn’t quite nail them this time around; and Cathedral Gorge and Echidna Chasm I also need to tackle again! While I wait; I’ll escape into photos like this and dream I am living at Purnululu! – More Bungles images can be seen in my Kimberley gallery. Xmas has come early at FBJ HQ. Today I have launched a new Fun&Free page on my site presently featuring free high quality wallpapers for your computer screen! Yes it’s all free for you dear reader, gratis, no charge! Choose from 10 wallpapers in 6 sizes featuring everything from the Great Barrier Reef to Copenhagen to a majestic African elephant on old grainy film. I want you to fully enjoy these gorgeous images so I am making them available in very high quality and large image sizes with no visible watermark. In return please honour the copyright notice and only use these images for personal use and for computer wallpaper only! 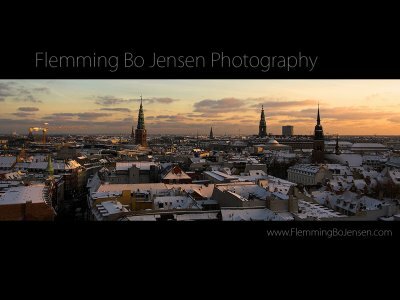 You can’t beat something for free in these tough financially challenged times so click here and enjoy free Flemming Bo Jensen wallpapers! When I left for Australia I returned the Fuji G617 camera to owner Ivar Mjell (thanks again mate for letting me use it). Just before returning it I got in one last shoot on an August evening where the weather was very kind to me. This shows the massive view captured by the Fuji G617 with the fixed 105mm lens. I would have liked to zoom in a little, those buildings on the left are ugly. Another option is rotating this massive camera! I have attempted a vertical 617 shot many times but this is one time where I feel it actually worked. To fill a 3:1 frame at such a wide angle view you need something very tall in the composition – in this case the gorgeous clouds. If someone made an affordable practical 617 digital camera I would use nothing else. I really enjoyed shooting in the 617 format and being able to compose a 3:1 panorama in the viewfinder, no guesswork and no digital stitching. Nothing beats that. I am addicted to the creative power of the digital darkroom and the digital workflow so I didn’t enjoy the slow process of using transparency film again, getting them processed and scanned etc. But a digital 3:1 camera would be the best of both worlds. Note to camera manufactures: It does not need to be a 6x17cm sensor, just do 2 x 35mm sensors next to each other! During my recent photo trip to Australia there were many times where I really wished I had the 617. Looking at some of my stitched digital panoramas I just know that on some of them I would have improved the composition (more about this later) a lot could I actually see the end product in the viewfinder. Then again; of course there are some shots I would have missed altogether because I would have been changing film or mucking with the manual settings etc. Some day when I can afford it I may end up carrying both a digital camera and an old 617 film camera. I read a lot of photographer blogs and books. I spend hours at every gallery I visit be it online or in real life. I view perhaps a hundred photos everyday for inspiration and enjoyment. Photos shot with everything from digital point and shoots to DSLR’s to 617 pano cameras to 8×10 view cameras. There are many brilliant photographers out there using whatever equipment they choose to use. No camera ever took a photo anyway. Photographers take photos! Not cameras! Is there a point coming up? Yes! Based upon the millions of photos I’ve viewed and my own experience I generally find 617 panorama photographers do better and stronger compositions than photographers doing digital stitched panoramas. I know that’s a strong generalisation and it’s only my opinion of course. There are great 617 photographers out there; there are great digital stitched pano photographers out there. But generally; I find the compositions stronger in true panoramas like the 617 (I don’t mean my own feeble attempts). If you know how to work a composition you know one step makes all the difference. One step in the right direction makes all the elements line up in your composition. Or maybe you need to get down lower. Or up higher. This is much easier when you can see your composition in the viewfinder than when you’re stitching many vertical shots together. That’s why I find 617 shots have stronger composition. There are probably other reasons. The 617 photographers have probably been doing it much longer; more experience. Half the planet doesn’t own 617 cameras; only pro photographers and pano enthusiasts meaning the quality should be higher in general. Of course there are many boring 617 shots as well and many brilliant digitally stitched panoramas. Still; in general the 617 pano compositions look stronger to me! I usually shoot a cropped panorama of the same scene as I shoot a stitched panorama and often the cropped has better composition. That’s why an affordable digital 3:1 camera – like a digital Hasselblad X-pan – would be most welcome! The quintessential. The essence. No; I am not only writing this follow up post to the quintessential Outback Australia photo because I really like those two words! I am also writing this follow up post because I happen to be obsessed with Outback Australia and in my quest for the perfect outback image I want to share two new releases and some techniques. Next up is one of the classic outback subjects; the windmill. This particular windmill is not all that exotic; it’s simply found outside of Derby in The Kimberley. I am featuring it here as I want to talk about the processing. This was shot in them middle of the day with the harsh Kimberley sun baking the landscape. My processing here is inspired by the brilliant Australian western The Proposition. This movie features the outback itself as a strong character in the movie through brilliant cinematography. I read an interview with the cinematographer sharing how he desaturated the blue sky to an almost pale grey and then saturated the ground to achieve a scorched red earth quality and push the feeling of harshness and heat. 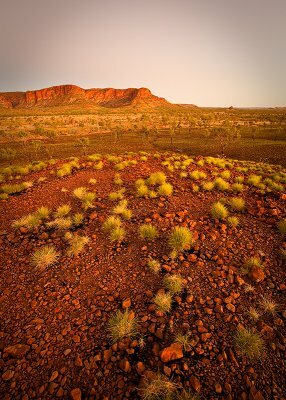 Inspired by this I have created this image where the blue in the sky is heavily desaturated and the red and orange of the earth and the golden spinifex grass is saturated. I feel this works well and helps push a feeling of a harsh, bright and very hot and sweaty environment! 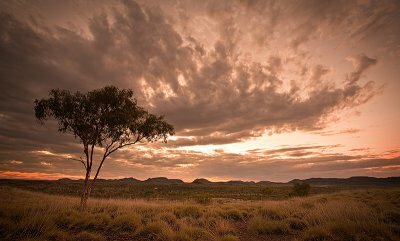 I invite you dear readers, to link to your favourite Outback Australia image, either your own if you have one or another artist. I do buy other photographers outback art so who knows; your image could end up on my wall!